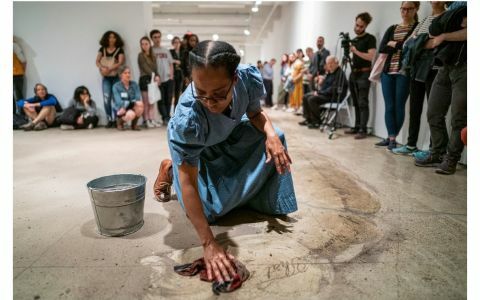 PHILADELPHIA — In a second-floor gallery at the Fabric Workshop and Museum here on Saturday, a woman used a dish towel printed with an image of the Confederate battle flag to clean a layer of dust from a section of the Declaration of Independence inscribed on the concrete floor. The silent, 20-minute performance accompanied the opening of Ms. Clark’s exhibition titled “Monumental Cloth, the Flag We Should Know,” in which she highlights the little-known Confederate Flag of Truce, a dish towel used by Confederate forces to surrender the Civil War at Appomattox, Virginia, on April 9, 1865. A huge linen replica of the truce flag, measuring 15 feet by 30 feet, or 10 times the size of the original, has been woven by the museum, and sits in a separate gallery on the eighth floor, near 100 smaller versions of the flag, all woven to scale. Ms. Clark, a professor of art and art history at Amherst College in Massachusetts, is presenting the truce flag as a counterweight to the familiar red and blue battle flag of the Confederacy that is commercially reproduced on merchandise including T-shirts, bumper stickers, and dish towels, and is seen by its critics as a symbol of racism. That the truce flag — now housed at the Smithsonian Institution in Washington, D.C. — is overshadowed in popular culture by the battle flag is, Ms. Clark argued, a sign that America has yet to erase a racist past that sparked the Civil War. By giving new prominence to the truce flag through its scale and number at the exhibition, Ms. Clark is hoping that people will accept it as the symbol of reconciliation that it was meant to be, in contrast to the battle flag that opponents see as an emblem of division and defiance. Susan Lubowsky Talbott, executive director of the museum, said the exhibition is especially relevant at a time of renewed white nationalist activity, like the rally in Charlottesville, Va., in August 2017, where a counterprotester was killed. “It’s so important right now that sadly, the timing for this show couldn’t be better,” Ms. Talbott said. Recognition of the Confederacy is widespread. The Southern Poverty Law Center reported in 2019 that 114 Confederate symbols have been removed since the Charleston, S.C., attack — and that 1,747 still stand. Many of these monuments are protected by state laws in the former Confederate states. Kate Masur, an associate professor of history at Northwestern University, said that drawing attention to the truce flag has the potential to shift public perceptions about the end of the Civil War that are now dominated by the battle flag. The battle flag’s associations with white supremacy and no-surrender aren’t likely to be dislodged among its adherents, Ms. Masur said, but people who attend the exhibition may come away with a new perspective. “Will it make people who engage with her exhibit think differently about American history? It certainly could,” she said. The huge truce flag was created in three sections by a commercial weaver in Pennsylvania, and stitched together, Ms. Talbott said. The weaver didn’t have the ability to incorporate three red lines from the original flag, so the lines were handwoven by museum staff after researching dyes that would have been available at the end of the Civil War. Brittany Webb, a curator at the nearby Pennsylvania Academy of the Fine Arts, called Ms. Clark’s performance, titled ‘‘Reversals,’’ a provocative and patriotic act that sought to highlight divisions between the battle flag and the founding principles of the Declaration. “Somebody is using a battle flag to clear away the historical debris to remind everyone that this is an ideal that is supposed to be important to us all,” Ms. Webb said.